Son Ye-jin (born Son Eon-jin on January 11, 1982) is a South Korean actress. She rose to fame in romance-themed films and television series such as The Classic (2003), Summer Scent (2003), A Moment to Remember (2004), and April Snow (2005). She has won acting recognition for her versatility in diverse genres, notably in Alone in Love (2006), My Wife Got Married (2008), The Pirates (2014) and the 2016 films The Truth Beneath and The Last Princess. 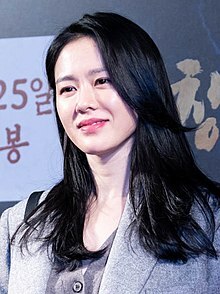 Son Ye-jin first appeared in a supporting role in Park Ki-hyung's film Secret Tears in 2000, and then went on to take the leading role in television dramas such as Delicious Proposal, Sun-hee and Jin-hee, and Great Ambition. Her first high-profile role in cinema was in Im Kwon-taek's Chi-hwa-seon, which screened at Cannes and took home a Best Director award in 2002. The biggest success of her early career was in the subsequent films Lovers' Concerto and The Classic. Both were solid mid-level hits in Korea, and The Classic in particular — being a work of My Sassy Girl director Kwak Jae-yong — received wide exposure in countries such as Hong Kong and China, and launched Son into pan-asia stardom. Son further solidified her status as a Hallyu (Korean Wave) star in 2003 by taking the lead in TV drama Summer Scent, the third installment of season-themed tetralogy Endless Love drama series directed by Yoon Seok-ho. Her next two films also proved to be huge hits in Asia: A Moment to Remember, based on a famous Japanese series, set box office records in Japan and sold over two million tickets in Korea, while April Snow in which she co-starred with superstar Bae Yong-joon was also a hit in Japan and China. Son, who adorned a pure and innocent image in her films The Classic and A Moment to Remember, was given the title of the "Nation's First Love" in Korea. Son then cast off her nice girl image in her next projects. She took on the roles of a con artist in The Art of Seduction, an ambitious reporter in Spotlight, a femme fatale in Open City, and a divorcée in the critically acclaimed series Alone in Love. In 2008, her portrayal of a polyandrous woman in My Wife Got Married bagged her Best Actress honors from the prestigious Blue Dragon Film Awards and other local award-giving bodies. After filming the dark mystery White Night, Son wanted to do a more fun project, so she chose the romantic comedy series Personal Taste, followed by the horror-romantic comedy film Spellbound. In 2012, Son starred in her first blockbuster The Tower, a remake of the 1974 Hollywood disaster film The Towering Inferno. She returned to television in 2013 in the revenge drama Shark (also known as Don't Look Back: The Legend of Orpheus), then headlined Blood and Ties, a thriller about a daughter who suspects that her father was involved in a kidnap-murder case. Son reunited with Shark costar Kim Nam-gil in the 2014 period adventure film The Pirates, which received mixed reviews but was a commercial hit and won Son the Best Actress award at the Grand Bell Awards. Son next starred in the black comedy Bad Guys Always Die opposite Taiwanese actor Chen Bolin, a Chinese-Korean co-production that was filmed on Jeju Island. In 2016, Son reunited with My Wife Got Married co-star Kim Joo-hyuk in The Truth Beneath, a political thriller; where she received acclaim for her performance. She won Best Actress at the 25th Buil Film Awards and 17th Busan Film Critics Awards for her performance. She then played Princess Deokhye in the biopic The Last Princess, helmed by April Snow director Hur Jin-ho. The film drew positive reviews by critics and went on to become a box office hit, grossing US$40.35 million worldwide. Son was praised by critics for her "outstanding" performance in her portrayal of "the unfathomable depths of the emotional ups and downs of Deokhye"; winning multiple accolades for her performance. In 2018, Son starred alongside So Ji-sub in the romance film Be with You, based on the Japanese novel of the same name. The same year, Son returned to the small screen after five years with JTBC's romance drama Something in the Rain. The series was a commercial hit and Son received rave reviews for her performance. Son also starred in crime thriller The Negotiation, alongside Hyun Bin, playing a professional negotiator working to save hostages. ^ "Son Ye Jin Biography". Retrieved 2016-12-18. ^ "10LINE: Actress Son Ye-jin". 10Asia. 14 May 2010. ^ "Young, Charming and Innocent ? What More Could You Want?". Korea JoongAng Daily. 12 March 2001. ^ a b "MBC 史劇 접고 '트렌디'로 승부수…내달 20일 '선희 진희' 첫 방송". KMIB (in Korean). 31 July 2007. ^ a b "'대망' 남장여인 손예진 "어색"지적". The Korea Times. 31 October 2002. ^ a b "임권택감독 신작 '취화선' 캐스팅 완료". BNT News (in Korean). 1 June 2001. ^ a b "Actors and Actresses of Korean Cinema: Son Ye-jin". Koreanfilm.org. Retrieved 2012-04-20. ^ a b "<연애소설>, 크랭크업! 손예진은 아쉬움에 눈물까지 글썽". Max Movie (in Korean). 31 January 2002. ^ a b "<클래식>의 손예진, 빗속에서 7시간，영화를 깨치다". Cine21 (in Korean). 15 January 2003. ^ "손예진 "서툰 첫사랑의 손길, 제가 봐도 예쁘던걸요"". Hankook Ilbo (in Korean). 20 March 2018. ^ a b "Love and Destiny, New TV Series Set to Lure Chinese Audience". The Donga Ilbo. 10 June 2003. ^ a b "[영화가 단신] <내 머리속의 지우개> 크랭크 업 外". Cine21 (in Korean). 19 August 2004. ^ "'내 머리속의 지우개' 정우성과 손예진". Hankook Ilbo (in Korean). 26 October 2004. ^ "The Best Selling Films of 2004". Koreanfilm.org. Retrieved 2013-08-08. ^ "A Moment to Remember breaks Japanese record". Korean Film Council. 14 December 2005. ^ a b "Son Ye-jin to Star Alongside Bae Yong-joon in New Film". Korean Film Council. Retrieved 24 December 2004. ^ "Films Starring Sohn Ye-jin Attract 10 Mil. Viewers in Korea, Japan". KBS Global. 28 December 2005. ^ "Korean stars dubbed 'Nation's first love'". Kpop Herald. 10 June 2016. ^ a b "손예진 "왜 이제야!"". Hankook Ilbo (in Korean). 19 December 2005. ^ a b "Spotlight Shows Lives of Reporters". The Korea Times. 13 May 2008. ^ a b "SON Ye-jin as a Criminal Kingpin". Korean Film Council. 26 July 2007. ^ "손예진 "연애시대 통해 사랑 생각하게 됐다"". JoongAng Ilbo (in Korean). 24 April 2007. ^ "Alone in Love Review". Twitch Film. 1 September 2006. Archived from the original on 2 February 2014. ^ "Actress Son Ye-jin's Movie Picks". 10Asia. 23 December 2011. ^ a b "SON Ye-jin puts a new spin on marriage". Korean Film Council. 11 February 2008. ^ a b "Blue Dragon Award Goes to Sports Drama". The Chosun Ilbo. 21 November 2008. Retrieved 11 August 2015. ^ "Son Ye-jin, Ko Soo to Bring Mystery Romance". The Korea Times. 21 October 21, 2009. ^ ""Personal Taste" will gain flavor, says Son Ye-jin – Part 1". 10Asia. 16 April 2010. ^ ""Personal Taste" will gain flavor, says Son Ye-jin – Part 2". 10Asia. 16 April 2010. ^ "Son Ye-jin casts her spell over new romantic comedy". Korea JoongAng Daily. 2 December 2011. ^ "Queen of romance returns in disaster flick". The Korea Herald. 17 December 2012. ^ "Son Ye-jin returns to the small screen". Korea JoongAng Daily. 27 March 2013. ^ "'Emotional, skirmishing scenes exhausted us': Accomplice actors". The Korea Herald. 27 September 2013. ^ "Son Ye-jin Jumps into Action in Pirate-Themed Film". The Chosun Ilbo. 9 August 2014. ^ a b "Roaring Currents Named This Year's Best Film". The Chosun Ilbo. 24 November 2014. ^ "SON Ye-jin to Headline China-Korea Co-Production BAD GUYS ALWAYS DIE". Korean Film Biz Zone. 4 February 2015. ^ "Son Ye-jin to lead in political thriller". Korea JoongAng Daily. 19 August 2014. ^ "Son Ye-jin reveals her dark side". Korea JoongAng Daily. 20 June 2016. ^ "Korea's 'Last Princess' comes alive in new film". Korea JoongAng Daily. 29 July 2016. ^ "Actress Son Ye-jin reveals difficulties in playing historical figure". Yonhap News Agency. 29 June 2016. ^ Woo Jae-yeon (29 July 2016). "(Movie Review) Life is swept away in historical turmoil in 'The Last Princess'". Yonhap News Agency. ^ "'Last Princess' is career-defining film, says actress Son Ye-jin". Kpop Herald. 3 August 2016. ^ "SON Ye-jin and SO Ji-sub Come Together for Melodrama BE WITH YOU". Korean Film Biz Zone. 7 September 2017. ^ "Son Ye-jin Returns to Her Signature Melodramatic Role in New Film". The Chosun Ilbo. 16 March 2018. ^ "Actress Son Ye-jin to return to small screen". The Korea Herald. 10 January 2018. ^ "Son Ye-jin conquers Korean cinema, TV". The Korea Times. 10 April 2018. ^ "Son Ye-jin shows why she is queen of romance". Kpop Herald. 28 May 2018. ^ "Hyun Bin, Son Ye-jin to star in 'Negotiation'". The Korea Herald. 25 May 2017. ^ "Son Ye-jin focuses on the little things: For 'The Negotiation,' the actor played an active part in every detail of her character". Korea JoongAng Daily. September 28, 2018. ^ "문디남녀의 연애학개론，<첫사랑 사수 궐기대회>의 차태현＋손예진". Cine21 (in Korean). 18 June 2003. ^ "손예진 "성인 목소리 나올까봐 걱정했죠"". Yonhap News Agency (in Korean). 22 December 2006. ^ "Son Ye-jin not worried over provocative roles". 10Asia. 21 October 2009. ^ "Son Ye-jin Eyeing Melodrama After 'Chilling Romance'". The Chosun Ilbo. 1 December 2011. ^ "Son Ye-jin a pillar of support in 'The Tower'". Korea JoongAng Daily. 27 December 2012. ^ "Son Ye-jin to Debut Dark Family Saga". 10Asia. 18 October 2012. ^ "Pirate's life for Son Ye-jin". Korea JoongAng Daily. 5 August 2014. ^ "Actress Son Ye-jin hungered for road movie". Yonhap News Agency. 2 October 2015. ^ "(LEAD) Actress Son Ye-jin calls acting a 'marathon of consuming emotions'". Yonhap News Agency. 8 August 2016. ^ "(Yonhap Interview) Son Ye-jin says she gave her all as Princess Deokhye". Yonhap News Agency. 29 July 2016. ^ "'Melodrama queen' back to silver screen with remake of Japanese romance film". Kpop Herald. 11 March 2018. ^ "Hyunbin and Son Ye-jin collaborate for first time for JK Film's new thriller". Yonhap News Agency. 9 August 2018. ^ "[스타데이트] '탤런트 손예진'". BNT News (in Korean). 15 August 2001. ^ "손예진 "대본 보고 이런 게 사랑이라 생각했죠"". Yonhap News Agency (in Korean). 9 March 2006. ^ "손예진, '시크릿가든' 마지막회서 톱여배우 '손예진' 역할". The Chosun Ilbo (in Korean). 15 January 2011. ^ "(Yonhap Interview) Son Ye-jin says maturity not necessarily proportional to age". Yonhap News Agency. 28 May 2018. ^ "'2001 MBC 연기대상' 차인표". JoongAng Iilbo (in Korean). 30 January 2002. ^ "<오아시스> 영평상, 춘사상 작품상". Cine21 (in Korean). 2 December 2002. ^ "백상예술대상에 <집으로>". Cine21 (in Korean). 27 March 2003. ^ "40회 대종상 최우수작품상 '살인의 추억'". JoongAng Ilbo (in Korean). 20 June 2003. ^ "제24회 청룡영화제 남녀주연상에 최민식, 장진영". Max Movie (in Korean). 12 December 2003. ^ "곽재용 감독 `클래식`…국제사랑영화제 수상". Herald Corporation (in Korean). 19 March 2004. ^ "S. Korea sweeps Asia-Pacific film fest Festival". The China Post. 26 November 2006. ^ "<손예진, 연이은 상복>". Yonhap News Agency (in Korean). 4 January 2007. ^ "손예진, SBS연기대상 여자 최우수연기상". Star News (in Korean). 1 January 2007. ^ "손예진 김정은 한혜숙 등, SBS연기대상 10대스타상". Star News (in Korean). 31 December 2006. ^ Pais, Jon (27 April 2007). "43rd Baeksang Arts Awards". Twitch Film. Archived from the original on 19 October 2014. Retrieved 23 August 2015. ^ "2007 Asia Model Awards Model Star Award Jeong Jun Ho & Son Ye Jin". AMFOC. Retrieved 2018-07-23. ^ "Kim Hee-ae named best dressed 2007". The Korea Herald. 23 June 2014. ^ "비·박태환·손예진, '2008 스타일아이콘' 등극(종합)". Star News (in Korean). 31 October 2008. ^ "베스트 드레서 손예진 '반전 드레스(?)'". JoongAng Ilbo (in Korean). 9 December 2008. ^ "설경구-김하늘-정우성-손예진 청룡 인기스타상 4인4색 수상소감". Newsen (in Korean). 20 November 2008. ^ "눈물의 손예진 유일무이 3관왕 석권 기염, 청룡 여우주연상-인기스타상-베스트커플상". Newsen (in Korean). 21 November 2008. ^ "김윤석-손예진, 대학생이 뽑은 올해의 영화인상 수상". Star News (in Korean). 15 December 2008. ^ "[백상예술대상] 환호와 갈채, 탄식의 2시간". JoongAng Ilbo. 27 February 2009. ^ "Ko Hyun-jung, "Haeundae" win grand prize at PaekSang Arts Awards". Asiae. 29 March 2010. ^ "Lee Byung-hun, Son Ye-jin, Bong Joon-ho to win APN Awards". The Korea Times. 10 August 2010. ^ "1st Seoul Arts and Culture Award". HanCinema. 23 February 2010. ^ "Son Ye-jin receives best film actor award". 10Asia. 23 February 2010. ^ "Fantastic Film Festival kicks off for 11-day run". The Korea Herald. 17 July 2014. ^ "Son Ye-jin says she is lucky as actress and will stay close to audience". Hancinema. 19 December 2014. ^ "[T포토] 손예진 '사진기자가 뽑은 올해의 포토제닉'". TV Report (in Korean). 13 April 2015. ^ "Busan: Bu-il Awards Provide Counterpoint to Festival". Variety. 7 October 2016. ^ "THE AGE OF SHADOWS Tops Korean Association of Film Critics Awards". Korean Film Biz Zone. 3 November 2016. ^ "정우성-손예진, 부산 영평상 남녀주연상 수상". The Chosun Ilbo (in Korean). 10 November 2016. ^ "Son Ye-jin takes home This Year's Actress Award". HanCinema. The Dong-a Ilbo. 5 December 2016. ^ "Women in Film Korea Festival Held on December 7". Korean Film Biz Zone. 12 December 2016. ^ "INSIDE MEN Tops Korean Film Producers Association Awards". Korean Film Biz Zone. 27 December 2016. ^ "Hollywood Local Productions Dominate Nominations for South Korea's Blue Dragon Awards". The Hollywood Reporter. Retrieved 2016-11-19. ^ "INSIDE MEN Deemed Best Film at 37th Blue Dragon Awards". Korean Film Biz Zone. 29 November 2016. ^ "INSIDE MEN Takes Film, Director and Actor Awards in 5-Prize Daejong Sweep". Korean Film Biz Zone. 28 December 2016. ^ "Song Kang-ho, Son Ye-jin Get Top Nod from Journalists". The Chosun Ilbo. 17 January 2017. ^ "NA Hong-jin Tops Chunsa Film Art Awards". Korean Film Biz Zone. 2 June 2017. ^ "Seoul Awards names popular stars". Korea JoongAng Daily. 23 October 2018. ^ "손예진, 대중문화예술상 국무총리 표창..."초심 잃지 않겠다"". 10Asia (in Korean). 24 October 2018. ^ "'엘르 스타일 어워즈' 슈퍼아이콘…손예진·이정재 "내년에도 또 오고싶다"". Ilgan Sports (in Korean). 12 November 2018. ^ "2018 Nominees". Asian TV Awards. Wikimedia Commons has media related to Son Ye-jin.